IMPORTANT!!! Battery Life & Replacement Information - Please Read! The MK4 Integrated Bracket LipLight (904223) is the first light developed to incorporate the batteries directly into the light itself, making the overall package lighter as well as removing the need for an exterior battery pack and cumbersome power cable. The MK4 Integrated Bracket LipLight is intended for installation on all microphone booms, including wireframe booms, where a pivot screw is used to secure the microphone capsule. The MK4 Lip Light uses one SPOT and three FLOOD Super Bright LED’s to light the work area. The operator can easily switch between SPOT, FLOOD or SPOT and FLOOD light modes to change the size of the area illuminated via the single mode function button on the front of the unit. SPOT and FLOOD LED’s can be ordered in different color combinations allowing the same light to be used in different roles. The mode function button also allows the operator to adjust the lights brightness level providing additional flexibility. The Mk4 Lip Light is activated by depressing the lip switch on the back of the unit. 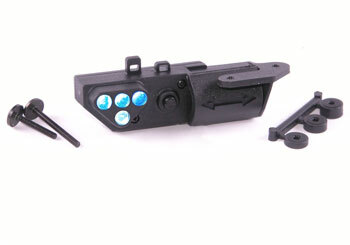 The MK 4 features a unique lock-out system to prevent the user from inadvertently activating the light when storing or during tactical operations and an adjustable “auto-off” function to maximize battery life.